Map o Cameroon showin the location o Yaoundé. 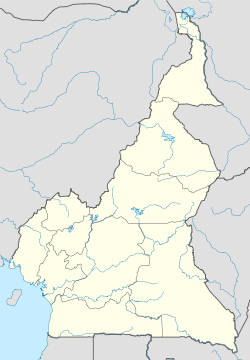 Yaoundé (/[unsupported input]ˌjɑːuːnˈdeɪ/ or /jaːˈʊndeɪ/, French pronunciation: ​[ja.un.de]) is the caipital o Cameroon an, wi a population o approximately 1.5 million, the seicont lairgest ceety in the kintra efter the port ceety Douala. It lees in the centre o the naition at an elevation o aboot 750 metres (2,500 ft) abuin sea level. Wikimedia Commons haes media relatit tae Yaoundé.